Although a fish tank background isn’t a crucial part in your aquarium theme, placing one behind your aquarium will enhance the theme. 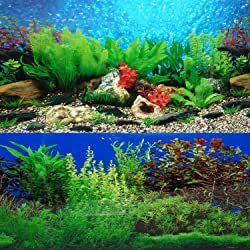 Besides making your aquarium look more brilliant, using a proper background will keep the fish at ease, which is also one of the major uses of aquarium backgrounds. How to choose an aquarium background? There are several choices available for aquarium backgrounds. You need to consider several things about the background that you select. The background you choose for your tank should complement your tank and actually fit in your tank. Be sure you check the size of the both aquarium and the background before buying. The background should not make your tank appear overcrowded. 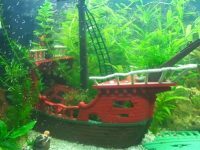 Because the size of the tank provides sufficient space required by your fish, overcrowding the tank can trouble the fish. Your fish should be able to move freely and feel comfortable in the tank. It is also important to keep in mind that your fish are the main attraction and not the aquarium backgrounds. 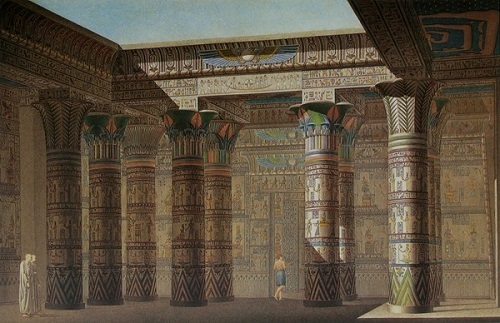 Ancient Egyptian theme. Image from Wikimedia. In planted aquariums, backgrounds aren’t really a crucial part. In fact, there are layouts using only driftwood, stones and aquatic plants that should not have backgrounds. However, an underwater background is a essential part of a Shipwreck Theme, the Pirate Theme would need scenery from a tropical beach, the Ancient Egyptian theme would need a desert background and so on. Printing your own fish tank backgrounds will of course be a little more expensive and take up some of your time. However, doing it this way will allow you to find unique backgrounds that will cater specifically to your concept. The backgrounds that you find online or in the shops might not be 100% to your liking. Or you may have a theme that really does not have any tank backgrounds on sale. 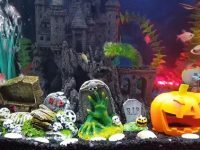 One simple example is the Halloween aquarium theme. This is a theme that there aren’t not many fish tank decorations that we can use. What we have to do in this theme is make use of aquarium decorations from various other themes and incorporate it to make our design. So you would definitely not be able to find a background to buy. Printing the background is really simple. All you need to do is search online for suitable ones. Some of the best backgrounds that you can use are actually PC Desktop Wallpapers. These are almost always created in vibrant colors and you can get them to suit any theme. 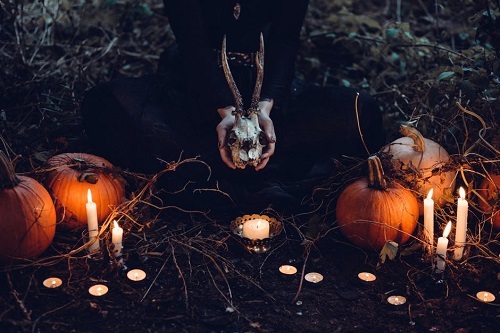 Try searching through Google Images for some awesome ones. Once you have found yours, you would need to save the image to your PC and open it with a Image Editor. I personally prefer using Photoshop because it does not distort the pixels and makes printing much easier. Resize the image to the measurement of your aquarium. When printing out the image, you would definitely need to print it out in pieces on letter size sheets of paper. This is fine because as you overlap the sheets to form the background, the side would not be easily seen. It would be a better idea to get the pieces individually laminated because that would make them waterproof or if the shop does larger laminating, you could join the pieces together and get them laminated as a whole. I prefer doing the latter because laminating them individually can make the joints be seen. This of course is the simplest option. All you need to do is go to your nearest pet store or search online where you will be able to find suitable tank backgrounds. You can easily find a beautiful fish tank background both flat or 3D one online. 3D aquarium backgrounds are three dimensional ones. They are typically made from various types of materials like glass, plastic, stones, shells, etc. 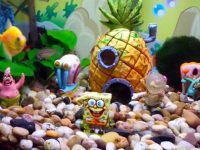 By using these materials, a fantastic environment can be created in the fish tank. It can be very hard to distinguish from the real one. But be aware that they are costly. Obviously, the cost will depend on the materials they are made of. The most important thing that you need to know is the dimensions of your aquarium. Always remember, bigger is better. Buying a background that is bigger than your tank will allow you to cut it to size. Buying it too small will cause ugly gaps where it doesn’t fit. Then, all you need to do is stick them to the back of your aquarium and enjoy. 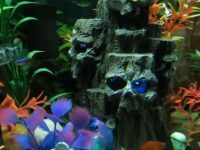 You can find the best aquarium backgrounds for your fish tank here. If you are a creative person, you may want to consider creating a background all by yourself. 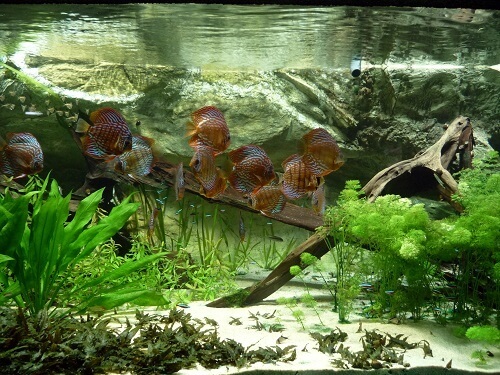 You can find separate decorative pieces for aquariums online and at most fish stores. 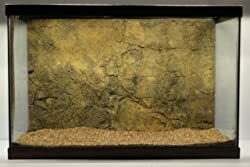 Doing this lets you create a beautiful background for your aquarium at an affordable price. You can use just about anything you have in your house for creating the perfect background. However you will have to be careful that it doesn’t contaminate the water and harm the fish. 3D fish tank backgrounds are awesome and make the aquarium look great. But they are only meant for large fish tanks because the protruding background will eat into some space. 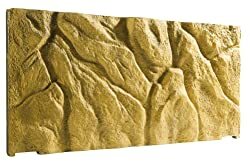 Basically what you need is some styrofoam, silicone glue, concrete and lots of creativity to DIY a 3D background. The whole process will take about two to three days to complete because you will need the concrete to dry in stages but believe me, it is worth the effort. You don’t really need a fish tank background but it will enhance the look of your theme. Fish tank backgrounds can easily be bought or if you have the time, why not have some fun and make yours.